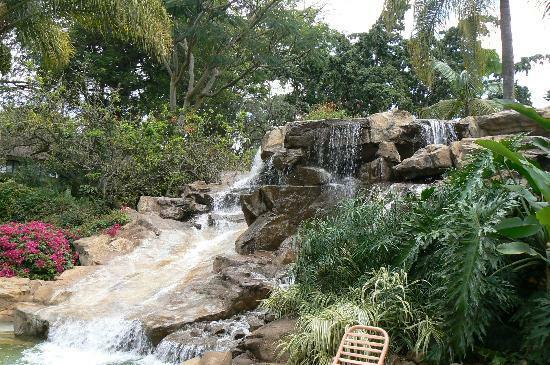 The Safari Park Hotel in Nairobi is more than just a hotel. It’s a huge resort with arguably the most facilities of all the Nairobi hotels. They include shows, entertainment, gambling and nightlife. The whole complex is decorated in African safari style. There are more than 200 rooms and suites in the Safari Park Hotel in Nairobi and each one has a veranda with a view of the hotel gardens. The decorating style is contemporary with touches of African ambiance. You will also find a private bathroom, mini-bar refrigerator and 24-hour room service with every room in the hotel. Other services include child care, laundry, a gift shop, shuttle service, safari booking and more. The dining alone can count as an adventure, with hotel restaurants serving a number of different cuisines. La Piazzetta will dish up a number of authentic old world Italian meals in a relaxed and casual setting. Another informal spot to eat is the Café Kigwa, with the feel of a busy deli. A more sophisticated meal can be had at either the Winners Pavilion for Chinese food, or Chiyo for Japanese cuisine. The grilled delights at the Nyama Choma Ranch are served along with a sleek Safari Cats stage show. There is as much to see outside the hotel as there is inside. There are 64 acres of grounds, all beautifully landscaped and maintained. Not only are you surrounded by trees, flowers and shrubs, there is a petting park and ostrich farm as well. Find a little more excitement at a gaming table. Who knows, you might go home richer than you think. Caribbean style tables for all your favourite casino games, like blackjack, baccarat, poker, and roulette. For more immediate gambling gratification, take a walk down King Solomon's Mine for more than a hundred computerized slot machines. Take some time to relax during your stay with a massage, manicure, facial or new hair cut. Or for something more active, take a swim in the pool, play a round of golf, or play a game of squash. Horseback riding is available only minutes away. If you are staying at the Safari Park Hotel for business rather than pleasure, you'll find many facilities to help in that regard. There is 24-hour Internet connections, fax machines, photocopying, public access computers, and secretarial services at your disposal. Any business gathering, from a small cocktail party to a conference of 1000 people can be accommodated well. Where is the Safari Park Hotel Nairobi? The Safari Park Hotel is right on the main Thika highway, giving great access to the rest of Nairobi by car or bus. It's only 15 minutes from the busy city center, or half an hour from Jomo Kenyatta International Airport. You can also get to the world-famous Nairobi National Park safari reserve in 30 minutes from the hotel. Other sights can be found in Nairobi, such as the National Museum, the Bomas villages, the Karen Blixen Museum and Uhuru Park. Take a cab or a matutu and you'll be seeing what Nairobi has to offer in minutes. The Safari Park Hotel Nairobi is right in the heart of all the action. For more information check this hotel at Africapoint. This friendly and patient Nairobi-based travel agency knows all hotels in Nairobi and can tell you personally whether it's this hotel that suits you best, or another Nairobi hotel. Another good source to check this hotel is Hotels Combined since they have user reviews, information, pictures etc. online. Compare their Nairobi hotels here. Both Africapoint and Hotels Combined often have competitive rates.